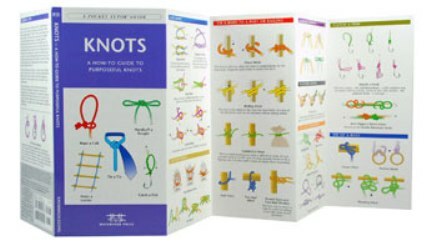 Pocket Tutor: Knots, 2002, by James Kavanagh, illustrated by Raymond Leung. Compact, laminated how-toe guide, profusely illustrated in color. Shows how to tie over 45 knots for a variety of purposes, from climbing to tying up a boat to tying a necktie or shoes. Folded to 4” x 8 ¼,” opens out to six 4” panels.